Finally, finally, finally! 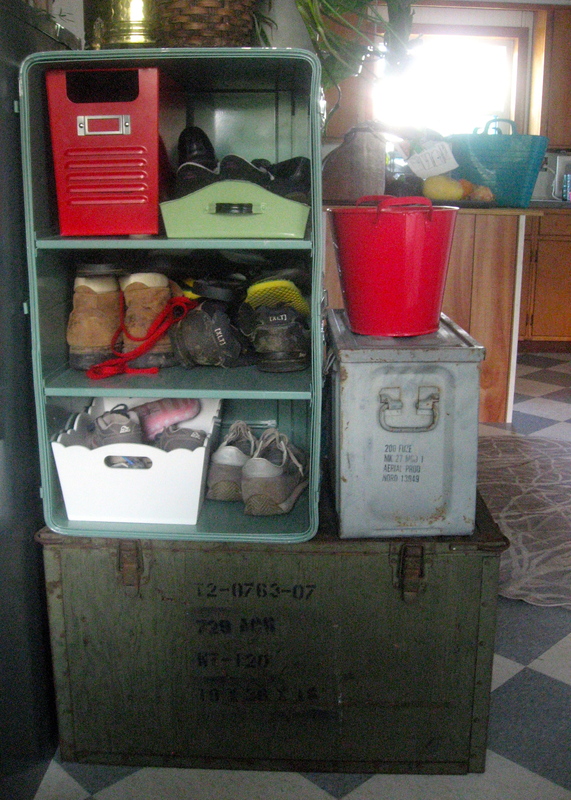 The mess of shoes and backpacks are off the floor, and we can live like civilized people again! 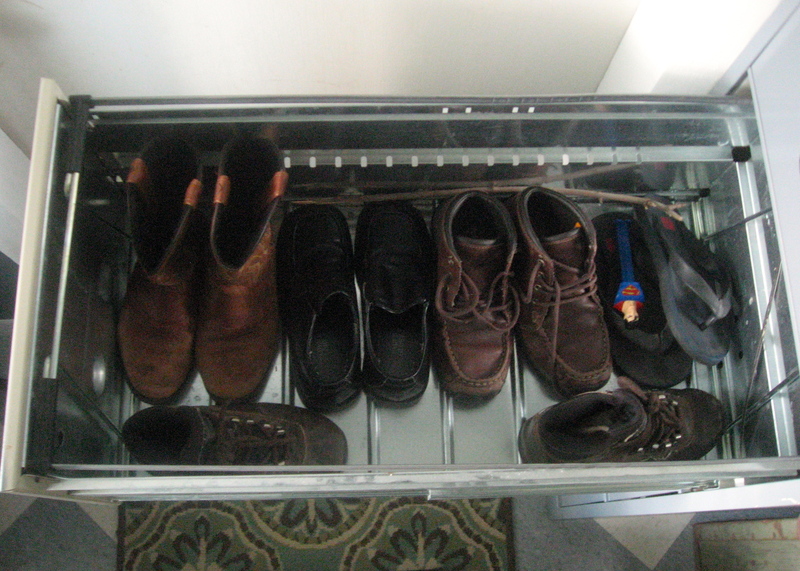 Civilized people who store their shoes in old ammunition boxes (Or maybe you just *think* there are out-of-season shoes in that bottom one ... ). Yes, we drove down and checked out the goods that I talked about last house post. We ended up getting some of everything he had to offer, and this is the rough draft arrangement. I really like the ammo and military medical containers (some with the years 1944 and 1955 stamped in them). Plus, I want my kids to be able to read "detonating fuzes" before anyone else's kids. 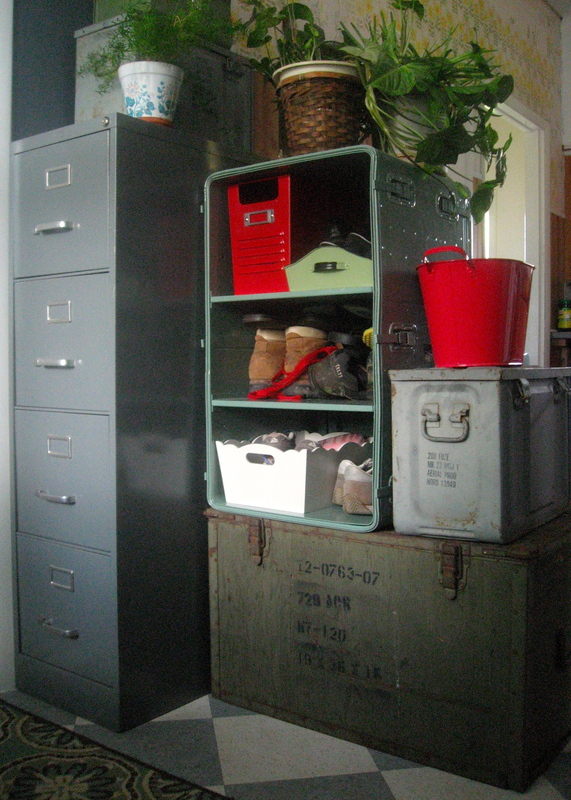 You'll also notice that we ended up getting a filing cabinet too, and I did spray paint it. 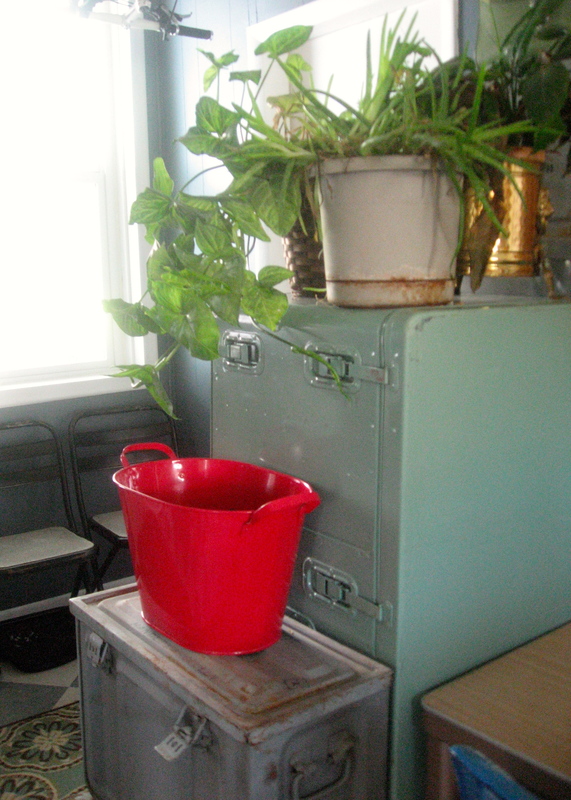 I just painted it grey, instead of some bold, fun color, because I didn't want it to be the star of the show, because, well, it's a filing cabinet. 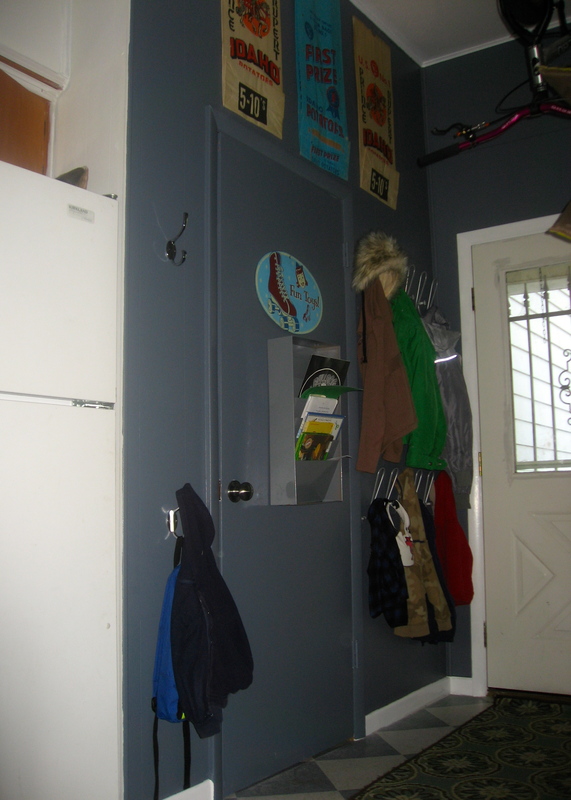 But, regardless of your feelings for filing cabinets, you have to admit that they contain impressive amounts of storage, and I'm confident that we'll be able to corral the mudroom needs for our family in here for a long time. I'm also happy to report that our new storage system does not block off the window, so the room still feels open and light. The other wall in here contains all our hooks for hanging, and my precious potato sacks, which are always a crowd pleaser. But, that may just be that I often have people from Idaho come through my house, and they're just starving to get a little positive recognition once in awhile. 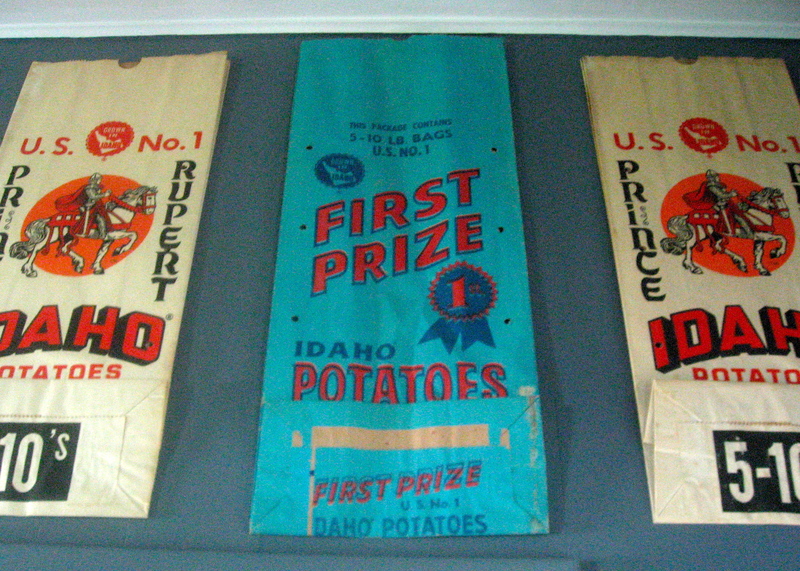 These potato sacks have been with me for longer than Woo has, and I'm happy to report that they're the best $0.75 I've ever spent (except for maybe on 7 of Macy's soft serve ice cream cones). I won't pretend that I'm happy with the quality of these pictures, though. 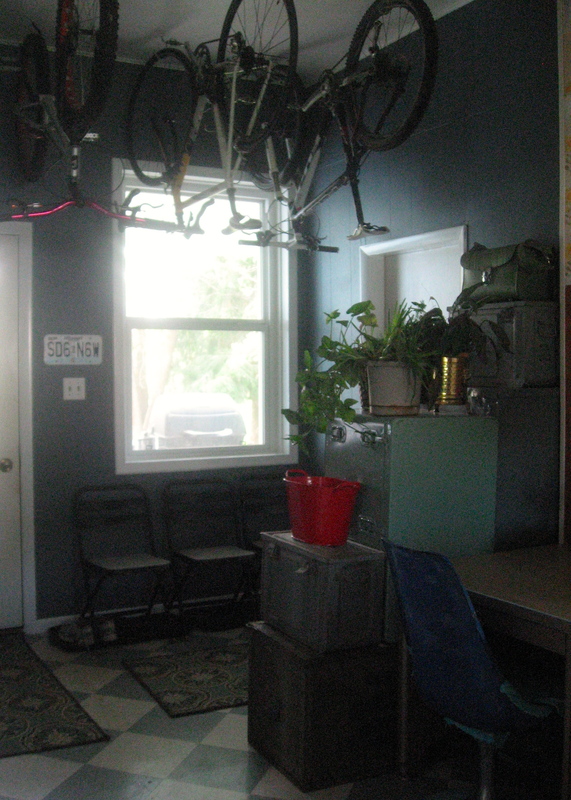 The picture below, is more representative of the light in the room, but still very grainy. Ugh. Here's to hoping my pictures only get better with time and practice. Still to do in this room? But, right now we're good enough to march forward with the kitchen!